The leaves aren’t the only thing changing at this time of year. The weather is also turning and it’s time to start transitioning from spring and summer to fall and winter, particularly when it comes to your wardrobe. School is well underway and if you’re still feeling disorganized, it’s time to change that. Even if you and the members of your household are out of school, there’s a good chance you’re going to be busier as the days get shorter and your chances for warm weather activities dwindle. It’s time to change with the seasons and that means reorganizing your closet. This can be a particular challenge if you have limited space, but there are ways to transition smoothly from summer to fall. Box&Co, your on-demand storage company here on Long Island, can help you with some tips on closet organization. The first step towards organizing your closet for fall is to make that seasonal wardrobe swap. HuffPost suggests that you take those summer clothes and give them one last wash to get rid of perspiration, stains and skin oil before you put them into storage. When you get your fall clothes back, don’t just start hanging things up. Decide if you’re going to really wear everything. Be honest! Closet space is limited. Get rid of what you don’t need. Better yet, donate your unwanted clothing to charity. Not everything you keep should be hung up either. Sweaters can stretch out of shape, so consider folding them, and putting them in drawers, onto shelves or into plastic bins at the bottom of your closet. Now that you know what you want from your fall wardrobe, it’s time to set up your closet. It’s important to put things in a closet that actually belong in that closet, House Beautiful advises. For example, you should put coats and umbrellas in your front hall closet, it shouldn’t be the landing place for random junk. Next comes organizing bedrooms. We mentioned folding sweaters, and denim is another fabric that can be folded rather than hung if space is at a premium. Brit + Co. suggests putting denim on shelves where they will be visible throughout the season. Because the weather can change at the drop of a hat this time of year, consider folding some T-shirts and keeping them handy as well, at least for the early part of the season. Fall is also when you start needing more personal storage space for extra accessories like hats and scarfs. Consider storing them all in the same place. If you have drawer space in your closet, create an accessory drawer. Also, you can do better than just tossing boots at the bottom of your closet. Consider displaying them better. Turn a crate on it’s side to create an instant display case. It’s time to say goodbye to summer and embrace autumn and Box&Co. We’ll make the transition easy for you. If you’re storing your summer items for the winter, all you have to do is order storage containers from us and we’ll deliver storage containers to you. You pack them, and we’ll come and pick it up. When you’re ready to use your stored items again, for example, bringing back your fall wardrobe, we’ll deliver your stored items right back to you. You can even monitor your storage account online. To get started, contact us today. 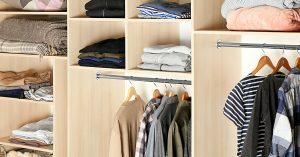 This articles lists helpful tips for organizing and decluttering a closet, including changing out your wardrobe on a seasonal basis.